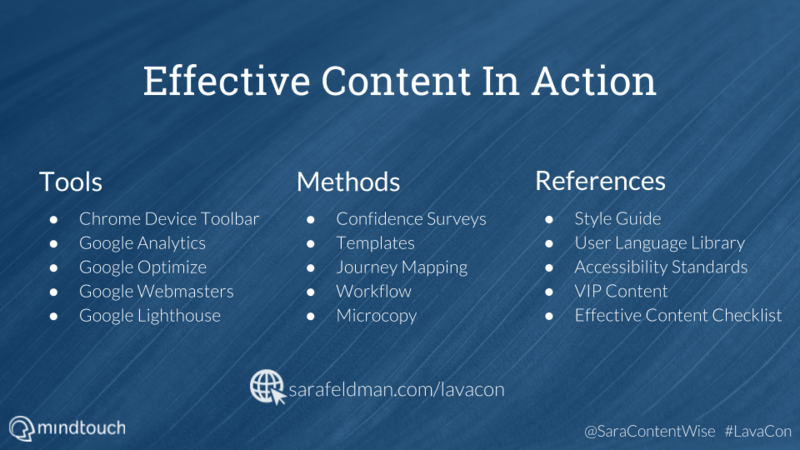 These are tools, methods, and references to operationalize how you create effective content. Chrome Device Toolbar – Test your site with a mobile emulator. Google Analytics – Intuitive default reports and endless custom reports. Google Optimize – A/B test variations of your website to determine what works best for your customers and business. Google Webmasters and Search Console – Guidelines and insights for how Google indexes your website. Google Lighthouse or Page Speed Insights – Test page load speed and get recommendations to improve. Templates – Build in structure and callouts based on effective content principles. Journey Mapping – Use this technique to reduce obstacles and identify opportunities for effective content. Workflow – Pre-determine efficient workflows for quick publishing. Style Guide – Include a #1 Rule! Follow these guidelines all the time, except when there is a good customer-focused reason not to. User Language Library – Record your user verbiage from feedback channels and online communities. Accessibility Standards – Ensure content meets standards for accessibility. VIP Content – Know which of your content converts the most and which is viewed the most. 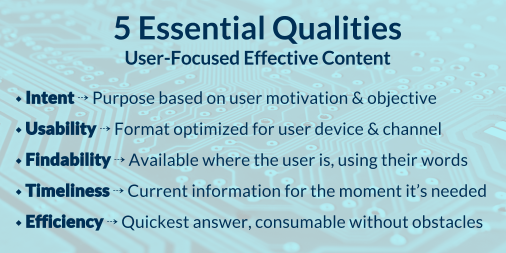 Effective Content Checklist – Save the graphic below for quick reference.